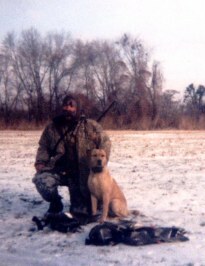 Sean is an avid sportsman, who enjoys hunting ducks, geese, wild turkey and deer. He has found an excellent partner in Millie, his yellow Lab. 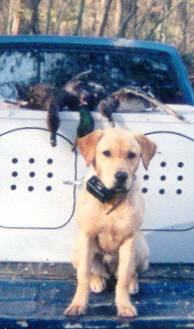 Give Sean a call and setup a training session or if you are really serious about your hunting then Sean will make an excellent addition to your next hunting party. Millie is an excellent young Lab out of English Stock. She shows lots of style and great looks. Her line goes back to the great English Champion KUPROS MASTER MARINER. 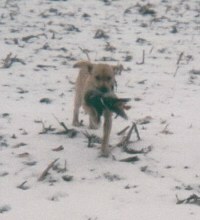 Millie has proven herself to be a very capable and easily trained hunting companion. At a very young age she has logged in many succesful hunts. PAHRC is looking to see great things from Millie in the years to come. She has great looks and is a pleasure to work and hunt with.